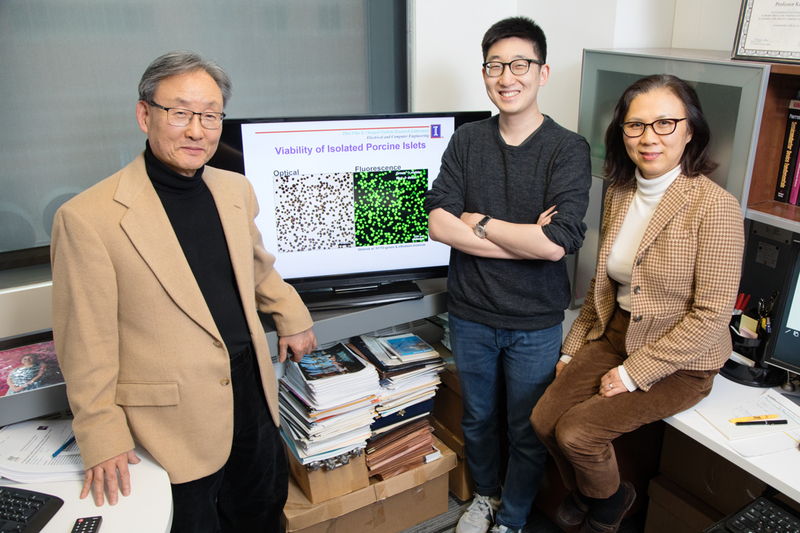 Illinois professor Kyekyoon ”Kevin” Kim, graduate student Benjamin Lew and research scientist Hyungsoo Choi developed a method to make it easier to transplant pancreatic islet cells from pigs to treat type I diabetes. CHAMPAIGN, Ill. — A drug-carrying microsphere within a cell-bearing microcapsule could be the key to transplanting insulin-secreting pig pancreas cells into human patients whose own cells have been destroyed by type I diabetes. 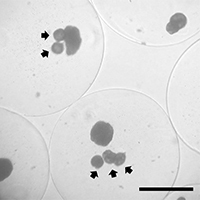 Pancreatic islet cells encapsulated along with microspheres that release a drug increasing viability in low-oxygen environments. The microspheres have arrows pointing to them; the larger blobs are the cells. In a new in vitro study by University of Illinois engineers, the insulin-secreting cells, called islets, showed increased viability and function after spending 21 days inside tiny capsules containing even tinier capsules bearing a drug that makes the cells more resilient to oxygen deprivation. The results were published in the journal Drug Delivery and Translational Research. Researchers have been exploring ways to transplant pancreatic islets to treat type I diabetes long term, eliminating the need for continual glucose monitoring and insulin injections. However, there are a number of challenges to this approach. “First, you need viable islets that are also functional, so that they secrete insulin when exposed to glucose,” said Illinois electrical and computer engineering professor Kyekyoon “Kevin” Kim, the leader of the new study. Islets from humans are scarce, he said, but pig tissue is in abundant supply, and pig insulin has been used to treat diabetes since the 1920s. Once islets are isolated from tissue, the next big challenge is to keep them alive and functioning after transplantation. To keep the transplanted cells from interacting with the recipient’s immune system, they are packaged in tiny, semipermeable capsules. The capsule size and porosity are important to allow oxygen and nutrients to reach the islets while keeping out immune cells. The method that the Illinois engineers developed allows them to make tiny, uniform capsules and control the size, allowing for a capsule-within-a-capsule technique. 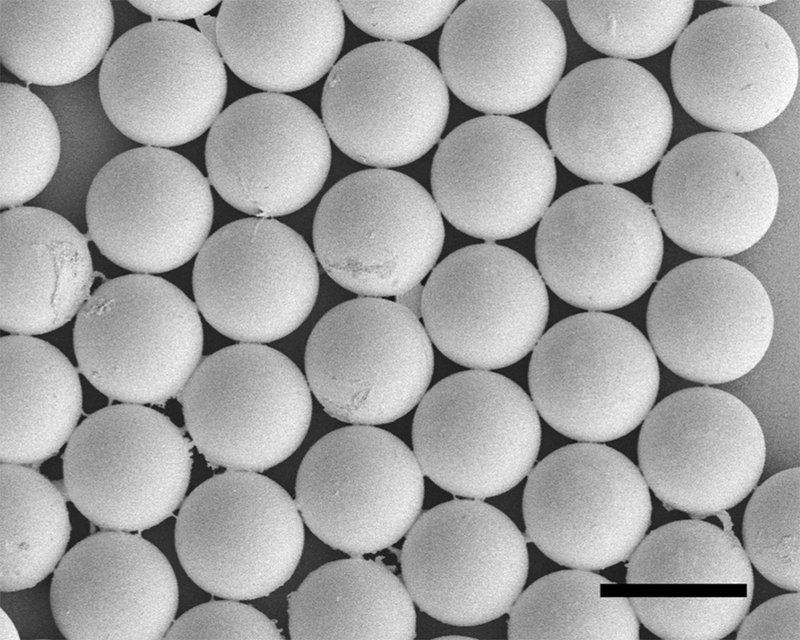 Kim and Choi have developed methods of making such microcapsules for various engineering applications and realized they could use the same techniques to make microcapsules for biological applications, such as drug delivery and cell transplants. Their method allows them to use materials of high viscosity, to precisely control the size and aspect ratio of the capsules, and to produce uniformly sized microcapsules with high throughput. “For a typical patient you’d need about 2 million capsules. Production with any other method we know cannot meet that demand easily. We’ve demonstrated that we can produce 2 million capsules in a matter of 20 minutes or so,” Kim said. With such control and high production capacity, the researchers were able to make tiny microspheres that are loaded with a drug that improves cell viability and that function in hypoxic conditions. The microspheres were designed to provide an extended release of the drug over 21 days. 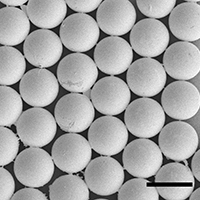 Researchers packaged pig islets and the microspheres together within microcapsules, and over the next three weeks compared them with encapsulated islets that didn’t have the drug-containing microspheres. After 21 days, around 71 percent of the islets packaged with the drug-releasing microspheres remained viable, while only about 45 percent of the islets encapsulated on their own survived. The cells with the microspheres also maintained their ability to produce insulin in response to glucose at a significantly higher level than those without the microspheres. Next, the researchers hope to test their microsphere-within-a-microcapsule technique in small animals before looking toward larger animal or human trials. Graduate students Benjamin Lew and In-Yong Kim were co-authors of the paper. Kim and Choi are members of the Micro and Nanotechnology Laboratory at Illinois, and Kim also is a professor of bioengineering and of materials science and engineering. Editor’s notes: To reach Kyekyoon “Kevin” Kim, call 217-333-7162; email: kevinkim@illinois.edu. To reach Hyungsoo Choi, call 217-244-6345; email: hyungsoo@illinois.edu.